One of the great things about curls is that you get a variety of looks you can try. Curls give a natural volume and hold to looks that other textures just can't achieve. This rope twist style is super easy, and is great for anything from a day in the office to a night on the town. You can leave it as a pony tail or finish the look out for a sophisticated bun that also doubles as a low manipulation protective style. Wash, condition, dry, and style curls like you normally would. You'll want to make sure to detangle them before getting started to avoid damaging curls. Don't be afraid to fluff your curls up a bit to create more volume, as this will help with the hold of the style. Section curls into three sections; one larger section in the back and two smaller sections framing your face. Divide the front two sections down the middle and secure with a no-pull elastic to hold them out of your face. Secure the middle section with an elastic at the nape of your neck. Twist the front to sections back and away from your face. Cross over the larger section, creating a twist around the already secured curls. Use bobby pins to hold in place. You can stop here if you choose for an elegant ponytail. 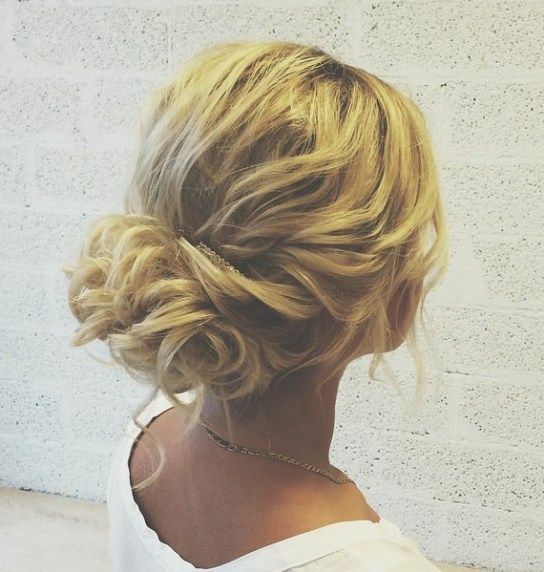 To finish the look, take the ponytail and wrap it up underneath itself, creating a low bun. You'll need a few bobby pins to hold the curls in place. Fluff the bun up so you've got a nice, round bun, similar to a fluffy rabbit tail. Finish your look by pulling down a couple of small tendrils to frame your face if you'd like. You can also spritz your curls with a light hold hair spray to keep them in place and help manage frizz and flyaways.